Vocal forest raptor. Common in Eastern forests and the West Coast. 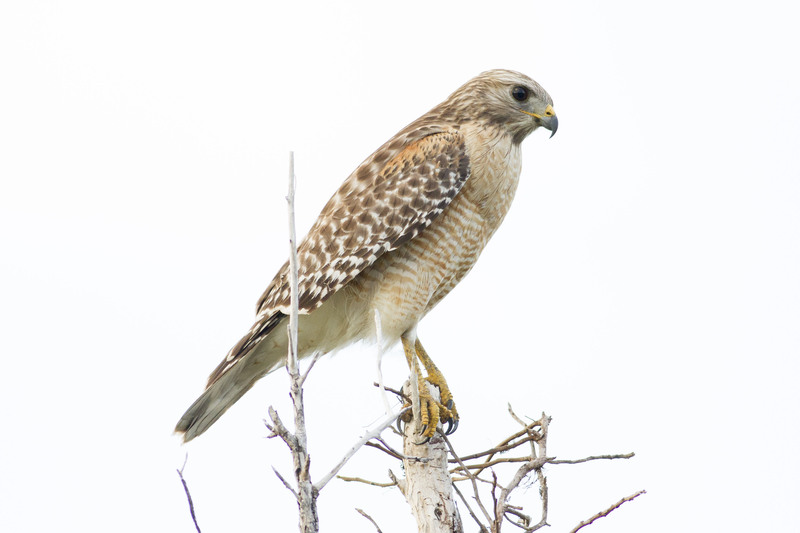 Mid-sized hawk with forward-reaching, long wings with pale outer crescents; adults show black-and- white checked back and salmon-barred breast, black striped tail; younger birds are brown above, pale below with brown streaks; 5 subspecies. Woodland bird that hunts from perches for small animals, mostly mammals, amphibians and reptiles. Stick nests up to 2 feet in diameter are often reused, typically just below the tree tops and near water. Lifespan up to 22 years. Population ~ 1.1 million and overall stable; declining steeply in parts of the East, probably due to deforestation.